At the Region is an ongoing feature that discusses the state-by-state training, certification and employment requirements of first responder departments across the nation. 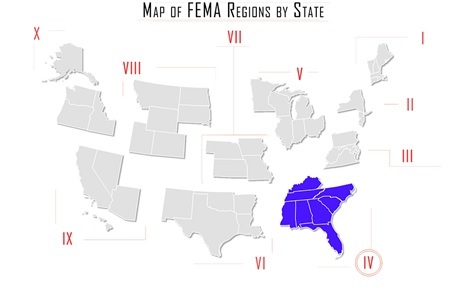 In this issue, At the Region looks at the Law Enforcement Certification requirements in Part One of FEMA Region IV: Kentucky, North Carolina, South Carolina, and Tennessee. The Kentucky Law Enforcement Council governs the training, qualifications, and certification of Kentucky Law Enforcement Officers. The KLEC is an independent administrative body of the Kentucky State government. • Has not had certification as a peace officer revoked in another state. • Proof that the officer has worked at least one year as a full time peace officer in the same state as the LEN training academy from which he graduated. The Executive Director shall verify that the officer has successfully completed a basic training course that was certified or approved by the peace officer standards and training council in the state where it was taken. The basic training must meet or exceed the approved basic training that was taught in Kentucky for the same year it was completed out of state. If the basic training is approved and graduation was after December 1, 1998, the applicant must meet all 17 Peace Officer Professional Standards, including the physical agility, suitability screener, polygraph and drug screen, prior to being hired. The North Carolina Criminal Justice Education and Training Standards Commission, through N.C.G.S. Chapter 17C, establishes minimum employment, training and retention standards for the State’s criminal justice officers. The Commission plans for the effective implementation of innovations in the State’s system of criminal justice employment, training and education. • Have successfully completed Basic Law Enforcement Training and passed the BLET state exam. o Four or more crimes or unlawful acts defined as "Class A misdemeanors" except the applicant may be employed if the last conviction occurred more than two years prior to the date of application for employment. • Have been fingerprinted and a search made of local, state, and national files to disclose any criminal record. • Have been examined and certified by a licensed physician or surgeon to meet physical requirements necessary to properly fulfill the officer's particular responsibilities and shall have produced a negative result on a drug screen. • Have been administered a psychological screening examination by a clinical psychologist or psychiatrist licensed to practice in North Carolina or by a clinical psychologist or psychiatrist authorized to practice in accordance with the rules and regulations of the United States Armed Forces within one year prior to employment by the employing agency to determine the officer's mental and emotional suitability to properly fulfill the responsibilities of the position. • Have been interviewed personally by the Department head or a representative to determine such things as the applicant's appearance, demeanor, attitude, and ability to communicate. • Notify the Standards Division of all criminal offenses which the officer is arrested for or charged with, pleads no contest to, pleads guilty to or is found guilty of. This shall include all criminal offenses except minor traffic offenses and shall specifically include any offense of Driving Under The Influence (DUI) or Driving While Impaired (DWI). A minor traffic offense is defined as an offense where the maximum punishment allowable by law is 60 days or less. The Commission mandated 620-hour course takes approximately 16 weeks to complete and concludes with a comprehensive written exam and skills testing. Out-of-state transferees will be evaluated to determine the amount and quality of their training and experience. At a minimum, out-of-state candidates must have two years of full-time, sworn law enforcement experience and have successfully completed a basic law enforcement training course accredited by the state from which they are transferring in order to be considered for transfer to a North Carolina law enforcement agency. Out-of-state transferees cannot have a break in service exceeding one year. Prior to employment as a certified law enforcement officer in North Carolina, out-of-state transferees must successfully complete the employing agency's in-service firearms training and qualification program. They must also complete the Legal Unit (minimum of 96 hours) of the Commission-certified Basic Law Enforcement Training (BLET) Course and successfully pass the BLET state examination within their 12-month probationary period. Persons who have completed training as a federal law enforcement officer will be required to complete BLET in its entirety and successfully pass the BLET state examination prior to employment. • A topical breakdown/syllabus of the courses that you completed in BLET. When an employing agency documents that an applicant has successfully completed a Commission-certified Basic Law Enforcement Training (BLET) course and meets the minimum employment standards, the Criminal Justice Standards Division issues Probationary Certification which is valid for one year. The new officer must satisfactorily complete a probationary period of not less than 12 months. Once the probationary period is completed, the officer is issued a General Certification. In North Carolina, the North Carolina Sheriffs' Education and Training Standards Commission is responsible for the certification of all justice officers, including deputy sheriffs, detention officers and telecommunicators, who are employed in the 100 Sheriffs' Offices in this state pursuant to N.C.G.S. 17E. The Commission also oversees the establishment, maintenance and upgrading of acceptable training courses. Once a deputy sheriff becomes initially employed as such with a sheriff‘s department, he/she is then placed on a probationary period for twelve (12) months. During the probationary period, the deputy sheriff should complete a Basic Law Enforcement Training Course. A deputy sheriff that does not complete a course delivery during the probationary period will no longer be able to perform the duties of a deputy sheriff. An individual may also choose to enroll in the Basic Law Enforcement Training Course at a local community college or at the North Carolina Justice Academy. The local college or Justice Academy should be contacted for their enrollment criteria. Successful completion of BLET remains valid for a period of one (1) year from the date of passing the state examination. If an individual completes a course delivery and begins employment with an agency more than one (1) year from the administering of the state examination, the individual's training would be considered invalid and he/she would be required to complete an additional course delivery. Some individuals sworn as deputies who have prior North Carolina law enforcement service may qualify as lateral transfers and not be required to complete any additional basic training. However, if the individual was under an obligation to complete in-service training and did not do so, he/she must make-up in-service training before performing law enforcement functions. South Carolina Law Enforcement Training and Certification is governed by Title 23 - Law Enforcement and Public Safety Chapter 23- Law Enforcement Training Council and Criminal Justice Academy. In June 2015, Regulations were published governing Law Enforcement Training. The implementation of these regulations is governed by the South Carolina Law Enforcement Training Council. Any questions concerning documentation or eligibility should be directed to the Registration Unit at (803) 896-7836. Once the required documentation is approved, the candidate’s eligibility to attend a Basic Training Session will be confirmed. The Tennessee Peace Officers Standards and Training (P.O.S.T.) Commission is responsible for developing and enforcing standards and training for all local police officers. The Commission also promotes continuing law enforcement training for the full time peace officers in Tennessee. Tennessee Law Enforcement training Academy holds five Basic Police School training cycles each year. A 105 hour Transition School Course is available at TLETA, designed to train law enforcement officers hired from another state, or in-state officers who have had a break in service of more than five (5) years but less than ten (10) years, or officers who attended an approved basic law enforcement school and has been hired after two (2) years of the completion of that training. This Transition School is mandated by POST Rule 1110-02-.01 in place of challenging the POST test.